100 Words, 100 Days: Day 9. On Concentration. | What I think About When I Think About Writing. ← 100 Words, 100 Days: Day 8. On Secularism. 100 Words, 100 Days: Day 9. On Concentration. My reading challenge for this summer is George R.R. Martin‘s A Song Of Ice And Fire. You might remember this fantasy saga from such spectacular television series as A Game of Thrones. It’s a sprawling seven book sequence (five already published, two to come) that demands concentration. And I’m fine with that. Last year’s reading challenge, Stephen King’s The Dark Tower, gave me all the preparation I needed. So far, so brilliant. With enough characters to fill up a dozen telephone directories, Martin’s epic fantasy saga is a treasure to hold and a pleasure to read. 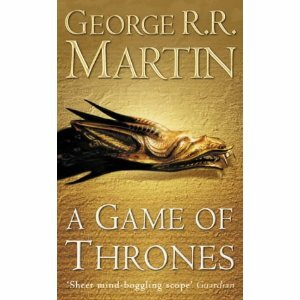 This entry was posted in 100 Days, 100 Words, Books, Reading, writing and tagged A Song Of Ice And Fire, Arts, Fantasy, Game of Thrones, george r r martin, George RR Martin, HBO, Television program. Bookmark the permalink. My hat’s off to you, Jimmy… I tried reading game of thrones several years back. Perhaps it was the number of characters, maybe it was all of the snow, but I just couldn’t get into it. Then again, it took me seven tries to read Catch-22 before that tome became an all-time favorite. Now, Dark Tower I’ve gone through twice, and while I still don’t like the ending, I am amazed and moved by the series.